For the Lithuanian landmark, see Napoleon's Hill. Oliver Napoleon Hill (born October 26, 1883 – November 8, 1970) was an American self-help author. He is known best for his book Think and Grow Rich (1937) which is among the 10 best selling self-help books of all time. Hill's works insisted that fervid expectations are essential to improving one's life. Most of his books were promoted as expounding principles to achieve "success". Hill was born in a one-room cabin near the Appalachian town of Pound in southwest Virginia. His parents were James Monroe Hill and Sarah Sylvania (Blair) and he was grandson of James Madison Hill and Elizabeth (Jones). His grandfather came to the United States from England and settled in southwestern Virginia during 1847. Hill's mother died when he was nine years old, and his father remarried two years later to Martha. His stepmother was a good influence for him: "Hill's stepmother, the widow of a school principal, civilized the wild-child Napoleon, making him go to school and attend church." At the age of 13, Hill began writing as a "mountain reporter", initially for his father's newspaper. At the age of 15, he married a local girl who had accused him of fathering her child; the girl recanted the claim, and the marriage was annulled. At the age of 17, Hill graduated from high school and went to Tazewell, Virginia to attend business school. During 1901, Hill accepted a job working for the lawyer Rufus A. Ayers, a coal magnate and former Virginia attorney general. The author Richard Lingeman said that Hill received this job after arranging to keep confidential the death of a black bellhop, whom the previous manager of the mine had accidentally shot while drunk. Hill relocated to Mobile, Alabama in 1907 and co-founded the Acree-Hill Lumber Company. In October 1908, the newspaper The Pensacola Journal reported that the company was liable to bankruptcy proceedings and charges of mail fraud. The newspaper reported that Hill's lumber company had bought lumber from outside Mobile, including other counties in Alabama and even from Florida, before it sold the lumber "at a much lower price and so far as known at this time have made no returns." During May 1909, Hill relocated to Washington D.C. and initiated the "Automobile College of Washington," where he instructed students to build, chauffeur and sell motor cars. The college assembled cars for the Carter Motor Corporation, which declared bankruptcy during early 1912. During April 1912, the automobile magazine Motor World accused Hill's college of being a scam relying upon on misleading marketing materials that would be "a joke to anyone of average intelligence". Hill's automobile college ended its business later that year. During June 1910, while managing his automobile college, Hill married his first wife, Florence Elizabeth Horner. The couple had their first child together, James, during 1911, a second child named Napoleon Blair during 1912, and a third son, David, during 1918. After his automobile college ended, Hill relocated to Lumberport, West Virginia with his wife's family. He later relocated to Chicago and accepted a job with the LaSalle Extension University before co-initiating a candy business that he named the Betsy Ross Candy Shop. During September 1915, Hill established and served as the dean of a new school in Chicago, the "George Washington Institute of Advertising," where he intended to teach the principles of success and self-confidence. On June 4, 1918, the Chicago Tribune reported that the state of Illinois had issued two warrants for the arrest of Hill, who was charged with violating blue sky laws for fraudulently attempting to sell shares of his school with a $100,000 capitalization, despite the school's assets only being appraised at $1200. The school ended soon afterwards. After the end of the George Washington Institute, Hill embarked on various other business ventures. He initiated several personal magazines, including Hill's Golden Rule and Napoleon Hill's Magazine. During 1922, Hill also initiated the Intra-Wall Correspondence School, a charitable foundation intended to provide educational materials to prisoners in Ohio. The foundation was directed by, among others, the check forger and former convict Butler Storke, who was later himself to be sent back to prison during 1923. According to Hill's official biography, this period was also when hundreds of documents associating Hill with various famous figures were destroyed in a Chicago storage fire. During 1928, Hill relocated to Philadelphia and convinced a Connecticut-based publisher to publish his eight-volume work The Law of Success. The book was Hill's first major success, allowing Hill to adopt an opulent lifestyle. By 1929, he had already bought a Rolls-Royce and a six-hundred acre property in the Catskill Mountains, with the aid of some lenders. However, the beginning of the Great Depression affected Hill's finances adversely, forcing him to foreclose his Catskills property before the end of 1929. Hill's next published work, The Magic Ladder To Success, proved to be a commercial failure. During the next few years, Hill traveled through the country, returning to his habits from the prior decade of initiating various short-lived business ventures. During 1935, Hill's wife Florence filed for a divorce in Florida. During 1937, Hill published the best-selling book Think and Grow Rich, which became Hill's best-known work. Hill's new wife Rosa Lee Beeland contributed substantially to the authoring and editing of Think and Grow Rich. Hill's biographers would later say this book sold 20 million copies during 50 years, although as Richard Lingeman remarks in his brief biography, "Alice Payne Hackett's '70 Years of Best Sellers' suggests the amount was considerably less." Wealthy once more, Hill re-initiated his lavish lifestyle and purchased a new estate in Mount Dora, Florida. After a few years, the couple divorced around 1940, with much of the wealth from the book going to his wife Rosa Lee Hill, leaving Napoleon Hill to start his pursuit of success once again. Hill met Annie Lou Norman, who was 47 years old, where he rented a room. They married during 1943, and relocated to California. Hill went on the lecture circuit once again. 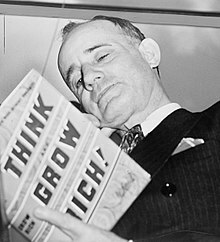 Napoleon Hill holding his book Think and Grow Rich, 1937. Hill's "Philosophy of Achievement" was offered as a formula for rags-to-riches success, published initially during 1928 in the multi-volume study course The Law of Success, a re-write of a 1925 manuscript. Hill identified freedom, democracy, capitalism, and harmony among the foundations of his "Philosophy of Achievement". He asserted that without these foundations, great personal achievements would not be possible. A "secret" of achievement was discussed in Think and Grow Rich, but Hill insisted readers would benefit most if they discovered it for themselves. Although he did not explicitly identify this secret in the book, he offered, 20 pages into the book: "If you truly desire money so keenly that your desire is an obsession, you will have no difficulty in convincing yourself that you will acquire it. The object is to want money, and to be so determined to have it that you convince yourself that you will have it... You may as well know, right here, that you can never have riches in great quantities unless you work yourself into a white heat of desire for money, and actually believe you will possess it." In the introduction Hill states of the "secret" that Andrew Carnegie 'carelessly tossed it into my mind', and that it also inspired Manuel L. Quezon of the Philippine Islands to 'gain freedom for his people, and went on to lead them as its first president.' Although he mentions a 'burning desire for money' repeatedly throughout the book, he also suggests it is not in fact his "secret" at all. By contrast, at the end of his first book, The Law of Success, nine years earlier, he identifies his secret as The Golden Rule: Only by working harmoniously in co-operation with other individuals or groups of individuals and thus creating value and benefit for them will one create sustainable achievement for oneself. He presented the notion of a "Definite Major Purpose" as a challenge to his readers to ask themselves, "In what do I truly believe?" According to Hill, "98%" of people had few or no strong beliefs, which made success unlikely. Hill used a story of his son, Blair, who he says was an inspiration to him because although Blair was born without ears, and though his doctor told Hill his son would neither be able to hear nor speak, Blair grew up able to hear and speak almost normally. Hill reports that his son, during his last year of college, read chapter two of the manuscript of Think And Grow Rich, discovered Hill's secret "for himself", and then inspired "hundreds and thousands" of people who could not hear or speak. From 1952 to 1962, Hill taught his Philosophy of Personal Achievement – Lectures on Science of Success in association with W. Clement Stone. During 1960, Hill and Stone co-authored the book Success Through A Positive Mental Attitude. Norman Vincent Peale is quoted saying "These two men [Hill and Stone] have the rare gift of inspiring and helping people... In fact, I owe them both a personal debt of gratitude for the helpful guidance I have received from their writings." It is listed in John C. Maxwell's A Lifetime "Must Read" Books List. Hill claimed insight into racism, slavery, oppression, failure, revolution, war and poverty, saying that overcoming these difficulties using his "Philosophy of Achievement" was the responsibility of every human. Later in life, Hill wrote that the turning point of his life had been a 1908 assignment to interview the industrialist and philanthropist Andrew Carnegie (d. 1919). During 1908, Carnegie was among the most powerful men in the world. Hill wrote, after Carnegie's death, that Carnegie had actually met with him at that time and challenged him to interview wealthy people to discover a simple formula for success, and that he had then interviewed many successful people of the time. The acknowledgments in his 1928 multi-volume work The Law of Success, listed 45 of those he had studied, "the majority of these men at close range, in person", like those to whom the book set was dedicated, Andrew Carnegie, Henry Ford, and Edwin C. Barnes (an associate of Thomas Edison). Hill reported that Carnegie had given him a letter of introduction to Ford, who Hill said had then introduced him to Alexander Graham Bell, Elmer R. Gates, Thomas Edison, and Luther Burbank. According to the publishers, Ralston University Press (Meriden, Conn.), endorsements for The Law of Success were sent in by William H. Taft, Cyrus H. K. Curtis, Thomas Edison, Luther Burbank, E.M. Statler, Edward W. Bok, and John D. Rockefeller. The list in the acknowledgments includes, among those Hill wrote that he had personally interviewed, Rufus A. Ayers, John Burroughs, Harvey Samuel Firestone, Elbert H. Gary, James J. Hill, George Safford Parker, Theodore Roosevelt, Charles M. Schwab, Frank A. Vanderlip, John Wanamaker, F. W. Woolworth, Daniel Thew Wright, and William Wrigley, Jr.
Hill openly described visits from spirits in Chapter 12 of his book Grow Rich! With Peace of Mind (1967). He described them as unseen friends, unseen watchers, strange beings, and the Great School of Masters that had been guarding him, and who maintain a "school of wisdom". Hill states that the "Master" spoke to him audibly, revealing secret knowledge. Hill further insists that the Masters "can disembody themselves and travel instantly to any place they choose in order to acquire essential knowledge, or to give knowledge directly, by voice, to anyone else." Grow Rich! With Peace of Mind was allegedly influenced by Hill's spirit voices; Hill cites the "Master", saying, "Much of what he said already has been presented to you in the chapters of this book or will follow in other chapters." Napoleon Hill died aged 87 on November 8, 1970. Hill's works were inspired by the philosophy of New Thought and the writings of Ralph Waldo Emerson, and are listed as New Thought reading. ^ Driscoll, Molly (April 26, 2015). "10 Best Self Help Books of All Time". Christian Science Monitor. Retrieved March 25, 2017. ^ Chang, Larry (2006). Wisdom for the Soul. Gnosophia Publishers. p. 514. ISBN 978-0-9773391-0-5. Retrieved September 10, 2014. ^ Hill, Napoleon (1937). Think and Grow Rich. Chicago, Illinois: Combined Registry Company. ISBN 1-60506-930-2. A similar quote regarding Thomas Edison is on page 230. ^ About Napoleon Hill Archived July 27, 2011, at the Wayback Machine, The Napoleon Hill Foundation. ^ Derby, George; White, James Terry. "The National Cyclopædia of American Biography: Being the History of the United States as Illustrated in the Lives of the Founders, Builders, and Defenders of the Republic, and of the Men and Women who are Doing the Work and Moulding the Thought of the Present Time". J. T. White – via Google Books. ^ a b c Lingeman, Richard (August 13, 1995). "How to Lose Friends and Alienate People". New York Times. Retrieved January 31, 2017. ^ Ritt, Michael; Landers, Kirk (July 1, 1995). A Lifetime of Riches. Dutton Book. p. 23. ISBN 0525941460. ^ Ritt, Michael; Landers, Kirk (July 1, 1995). A Lifetime of Riches. Dutton Book. p. 17. ISBN 0525941460. ^ Ritt, Michael; Landers, Kirk (July 1, 1995). A Lifetime of Riches. Dutton Book. p. 46. ISBN 0525941460. ^ "President of Lumber Company Is Missing". The Pensacola Journal. Pensacola, Florida. October 17, 1908 – via Chronicling America: Historic American Newspapers, Library of Congress. ^ Ritt, Michael J.; Landers, Kirk (July 1, 1995). A lifetime of riches: the biography of Napoleon Hill. Dutton Book. p. 41. ISBN 9780525941460. ^ "Pointing the Easy Route to GETRICHQUICKLAND". Motor World Wholesale. 31. Chilton Company. April 12, 1912. pp. 39–41. ^ Ritt, Michael J.; Landers, Kirk (July 1, 1995). A lifetime of riches: the biography of Napoleon Hill. Dutton Book. p. 35. ISBN 9780525941460. ^ a b c Emmert, J. M. (January 5, 2009). "The Story of Napoleon Hill". Success. Retrieved March 25, 2017. ^ Ritt, Michael J.; Landers, Kirk (July 1, 1995). A lifetime of riches: the biography of Napoleon Hill. Dutton Book. pp. 44–50. ISBN 9780525941460. ^ "TWO WARRANTS OUT FOR MODEST NAPOLEON HILL". Chicago Daily Tribune. June 4, 1918. Retrieved January 31, 2017. ^ Ritt, Michael J.; Landers, Kirk (July 1, 1995). A lifetime of riches: the biography of Napoleon Hill. Dutton Book. pp. 88–91. ISBN 9780525941460. ^ Ritt, Michael J.; Landers, Kirk (July 1, 1995). A lifetime of riches: the biography of Napoleon Hill. Dutton Book. p. 94. ISBN 9780525941460. ^ Ritt, Michael J.; Landers, Kirk (July 1, 1995). A lifetime of riches: the biography of Napoleon Hill. Dutton Book. pp. 122–125. ISBN 9780525941460. ^ "Rich Man, Poor Man: The Story of Napolean Hill". Success.com. Success Magazine. ^ a b Hill, Napoleon (1928). The Law of Success. Ralston University Press. ^ a b Hill, Napoleon (1937). Think and Grow Rich. Chicago, Illinois: Combined Registry Company. p. viii. ISBN 1-60506-930-2. ^ "Napoleon Hill Timeline". Napoleon Hill Foundation. Retrieved March 25, 2017. ^ Maxwell, John (March 2008). "A Lifetime "Must Read" Books List" (PDF). Archived from the original (PDF) on September 13, 2012. Retrieved March 25, 2017. ^ Hill, Napoleon (1937). Think and Grow Rich. Chicago, Illinois: Combined Registry Company. p. 8. ISBN 1-60506-930-2. ^ a b Ritt, Michael J.; Landers, Kirk (July 1, 1995). A Lifetime of Riches: The Biography of Napoleon Hill. Dutton Book. ISBN 0525941460. ^ a b c Hill, Napoleon (2010) . How to Sell Your Way Through Life. John Wiley & Sons. ISBN 0470541180. ^ Hill, Napoleon (1937). Think and Grow Rich. Chicago, Illinois: Combined Registry Company. ISBN 1-60506-930-2. ^ "Napoleon Hill". The Bee. November 10, 1970. p. 7. Retrieved June 5, 2017 – via Newspapers.com. ^ Horowitz, Mitch (January 1, 2009). Occult America: The Secret History of how Mysticism Shaped Our Nation. Bantam Books. p. 87. ISBN 9780553806755. This page was last edited on 5 April 2019, at 22:22 (UTC).